I am always trying to come up with creative ways to display my baskets. I have so many that they literally are in every room and every corner of the house. One of the hardest style/shape of basket is the tray or shallow bowl. Fortunately my father makes and sells a glass topped display table. It is basically a coffee table with a big shallow drawer, but the top is glass, so you can see whatever is in the drawer. 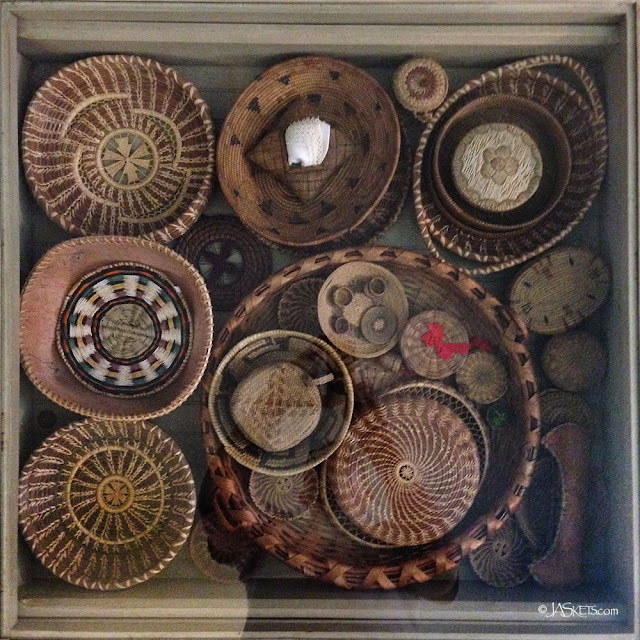 This works perfectly to display my many Native American baskets, pine needle trays and other shallow baskets. I must apologize for the crappy pic, but with the glass it was challenging to photograph.